Hideee Hoe gang!! 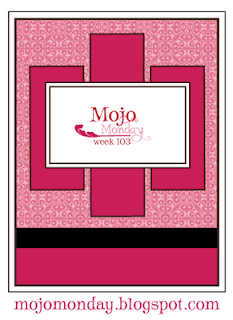 I couldn't resist this Mojo Challenge!! This 'Night and Day' Specialty Designer Series Paper inspired me and this stamp set is one of my favorites (it's on the dormant list). I Flipped the Mojo Layout on it's side and started off w/ just the tree in Black... then I flicked the sides in black on the paper and placed it on the Back paper. I took the black and edged it in silver (to tie in the silver snow). I was thinking this was a lil 'dark' but cool.. it needed a POP so I stamped w/ the Real Red the Bird and boots and w/ the tire swing... I liked it. My beloved hubby asked me why I didn't do what I've done before and used the large brad and twine thread. Bam - a Progression on a cool card into something a lil more... what do YOU think? Challenge: What can you take from Cool to WOW in a Progression?